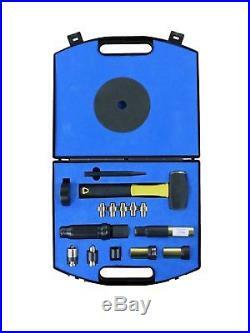 DYNOMEC locking wheel nut remover XL comprehensive master set. As used by the AA, recovery services, garages and tyre fitters. Removes most types of wheel lock nuts and rounded wheel nuts Detailed instructions on tool usage and lock nut types are included with the set. Set includes all the currently available blades. 1 x A blade made from S1 steel 1 x B blade made from S1 steel 5 x C blade for McGard style nuts 1 x D blade made from S1 steel 1 x Jaguar blade 1 x Range Rover blade. Body Club Hammer PVC Tape Hand protection ring. All parts contained in the set are consumable items due to the nature and usage of the tool. Parts for this set are available individually. For spare parts availability and further information ring. The item "DYNOMEC XL KIT DY025XL LOCKING WHEEL NUT REMOVAL INC JAGUAR AND RANGE ROVER" is in sale since Wednesday, October 31, 2018. This item is in the category "Vehicle Parts & Accessories\Car Wheels, Tyres & Trims\Nuts, Bolts & Studs". The seller is "carkeyrefurb" and is located in saffron walden, Essex. This item can be shipped to United Kingdom.